It’s pouring down with rain at the moment. I was sitting at the outdoor reception area checking my emails and social media messages, but I had to rush back to the motorhome as laptop was getting wet. I only just made it back before the real downpour started. 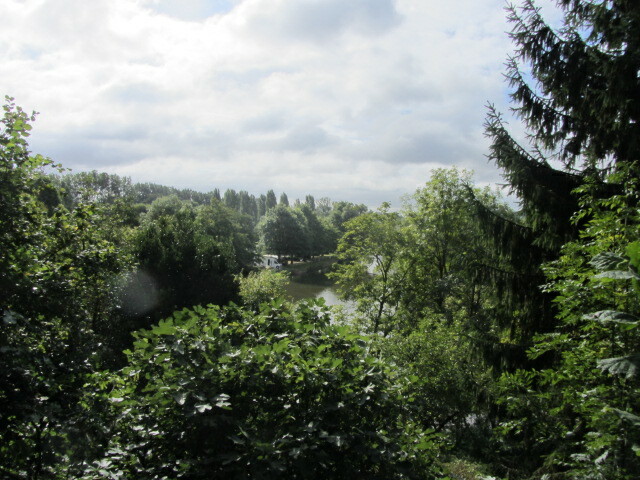 This is the second day of proper rain we’ve had since we left England, the first one being at Bourget-du-Lac back on 29th July, so we can’t complain and I’m sure the land needs it after such a hot and dry summer. 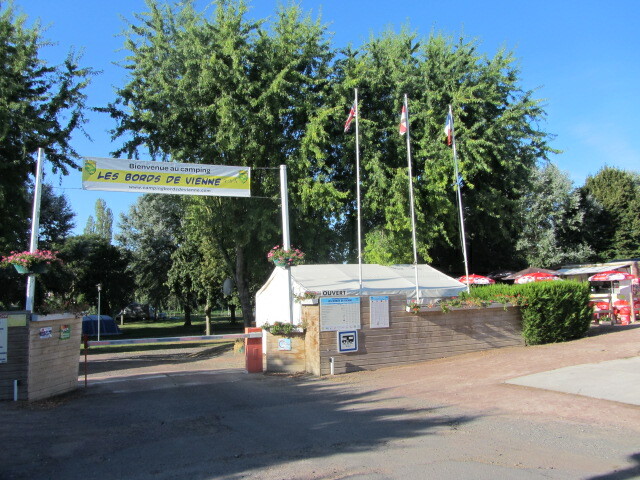 We arrived here on Friday just before 1 pm and, as reception was shut, we had to have lunch in the visitors’ car park and wait until 2 pm to install ourselves on our pitch. 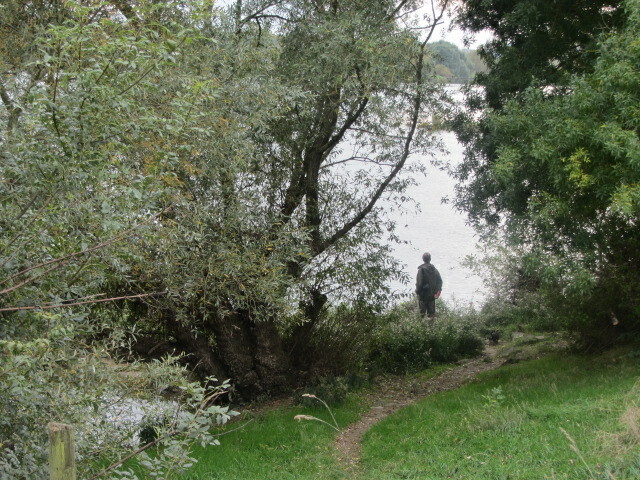 While we were waiting, we took the opportunity to walk down to the lake to see if our favourite pitch (number 208) was available and, as luck would have it, it was! So Adonis asked if we could take it and here we are for the sixth time on one of the best spots on the campsite, where Adonis can watch his fishing rods from, only a mere 5 metres away! 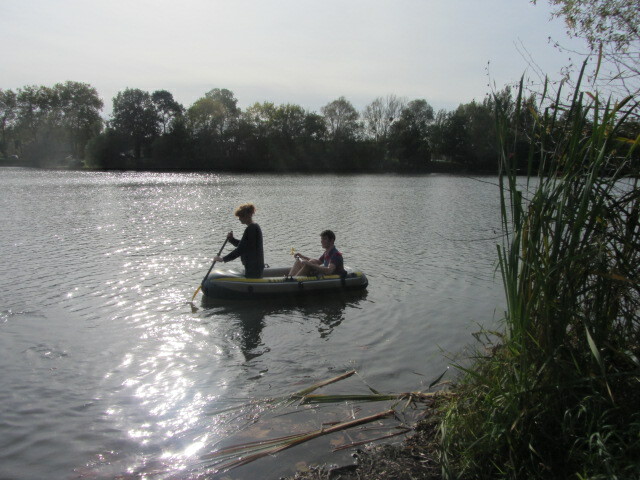 It was very hot when we arrived and, as I was about to go for a paddle in my inflatable boat, 2 very friendly children, Ollie and Megan from Stoke, approached me and asked where we were from in England. We talked for a little while and eventually met their dad too, John, who surprised me greatly by asking me if I blogged. On saying I did, he said he’d recognised me and that he’d read my blog and that was the reason why they were there. Isn’t that great? 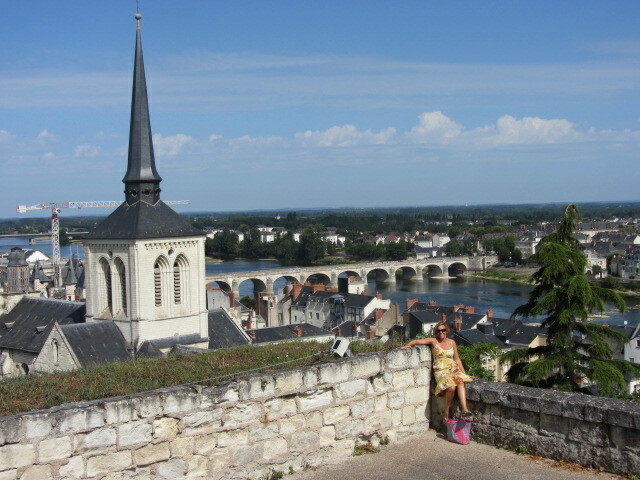 That’s all I ever wanted when I started publishing my diaries as blogs, to share travelling information with fellow travellers, so I’m delighted that my efforts have actually helped someone with a decision about their holiday destination. So John and Sarah, if you’re reading this now: you made my day!!! And thank you for reading. 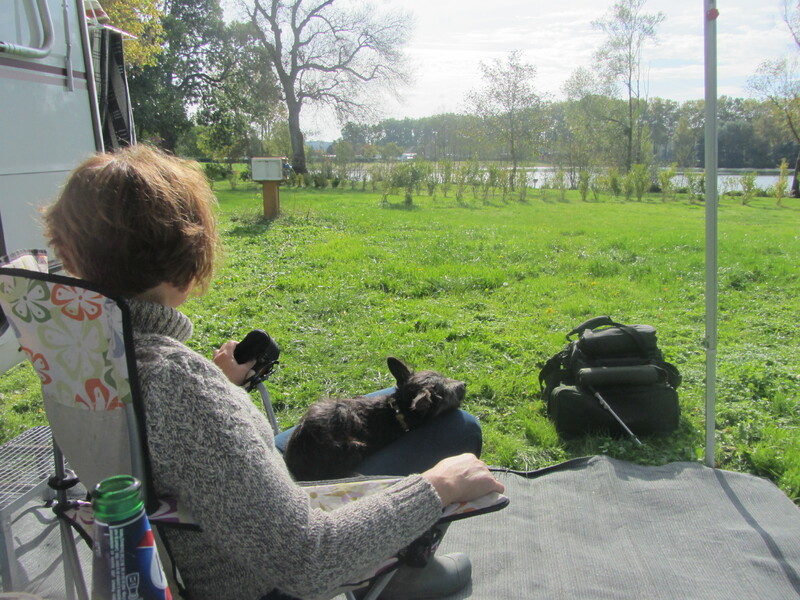 Just chilling at Lac des Varennes. 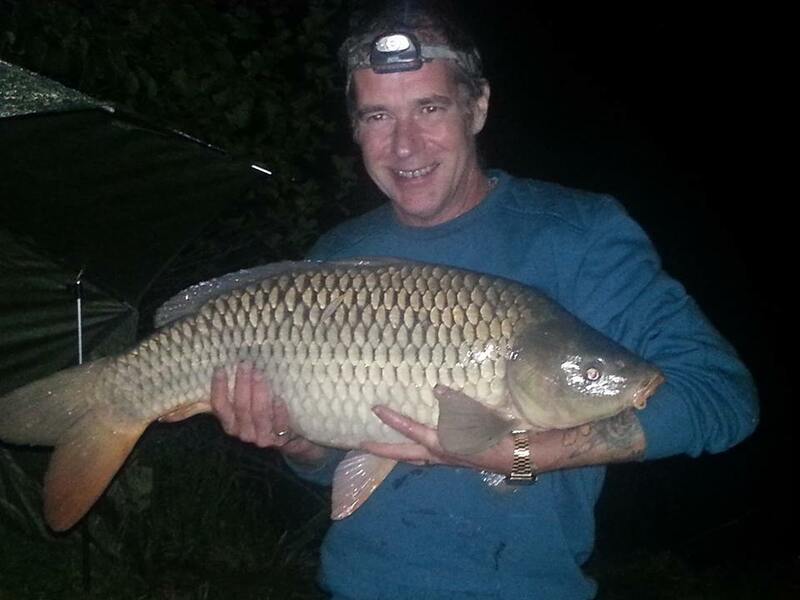 So we have spent another 3 very lazy days by the lake, fishing, crocheting, reading and occasionally checking my mail and today we’ve met another lovely couple from South Africa living in Southampton who have been travelling in their motorhome for 15 months with loads of interesting stories to tell. I just love meeting all these wonderful travelling people and could listen to them forever. 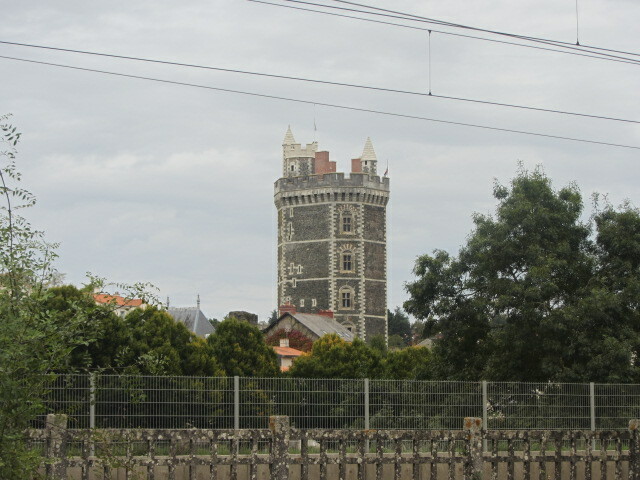 We have one more day here before setting off for Broglie, then shopping at Boulogne-sur-Mer and finally Wissant for our Eurotunnel crossing on Friday 30th. We have brought forward our departure by one day as we’re going to collect our new Jack Russell puppy and we want to spend a whole weekend with him before going back to work. 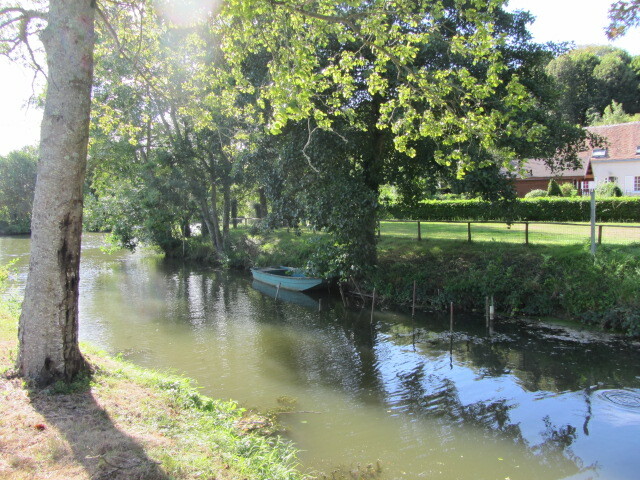 Before coming to Lac des Varennes, we spent one night at Souillac’s aire in Le Lot department, which is still free with a bourne for water for €3. 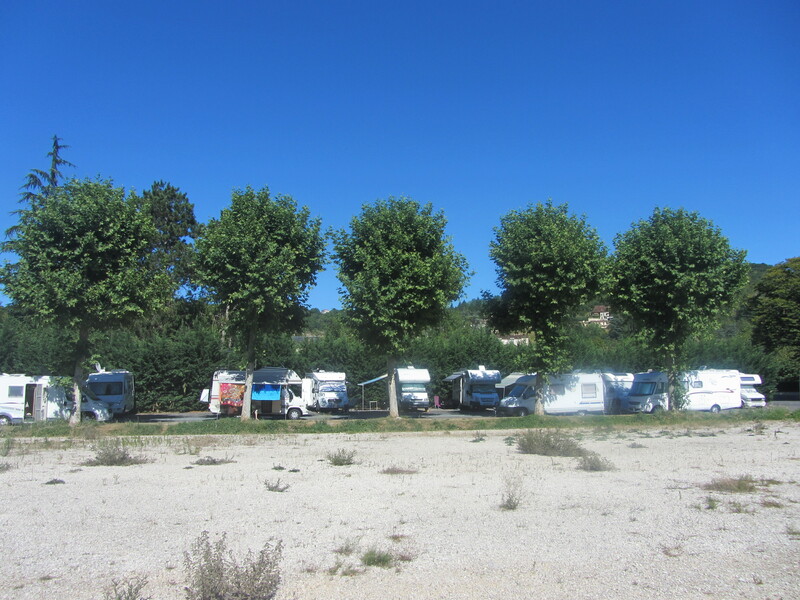 It was very hot, but we managed a pitch in the shade of some trees and we enjoyed a couple of swims in the Dordogne river, right by the Camping Las Ondines, only a 5-minute walk from the motorhome aire. 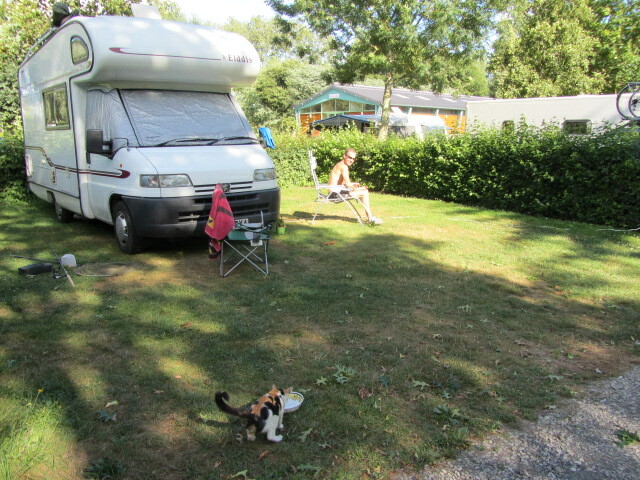 After that, we spent one day at Camping La Tête Noire at Buzançais in the Indre department. 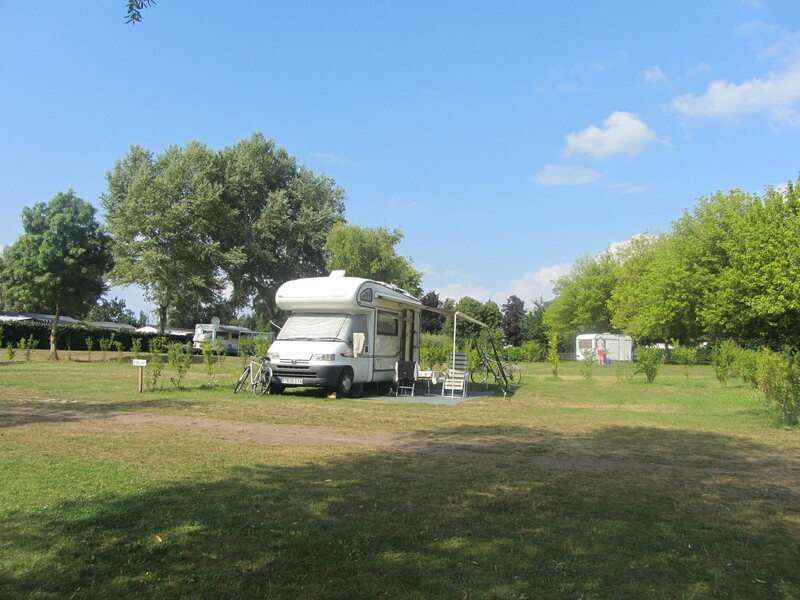 This is a charming little campsite with plenty of shade and clean facilities with an access ramp for the disabled. 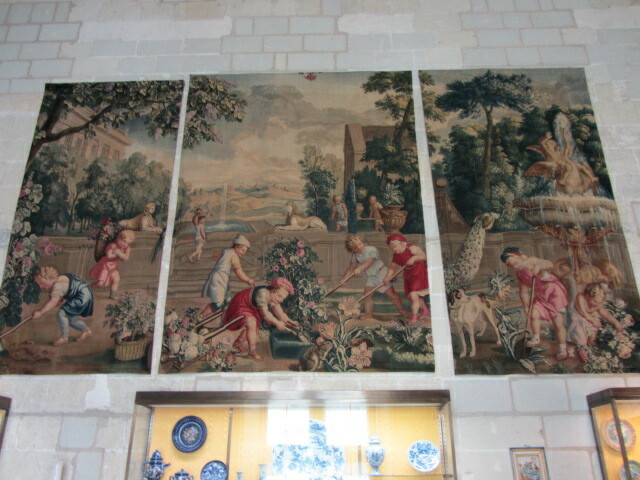 It very much reminded me of the municipal campsite at Beaumont-sur-Sarthe. 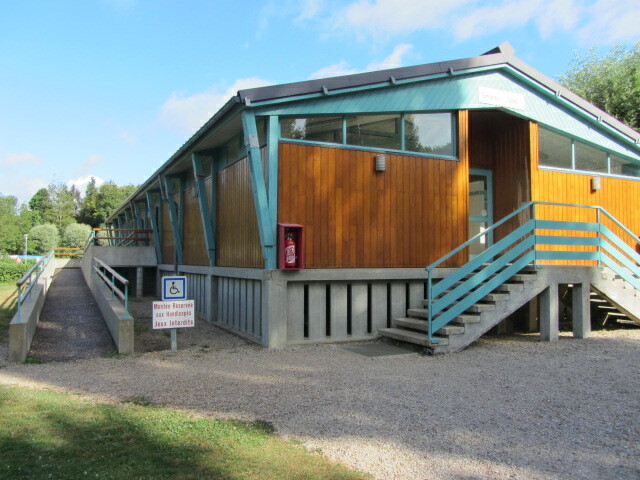 It was also very cheap at just over €14 for the night for the two of us with electricity supply. 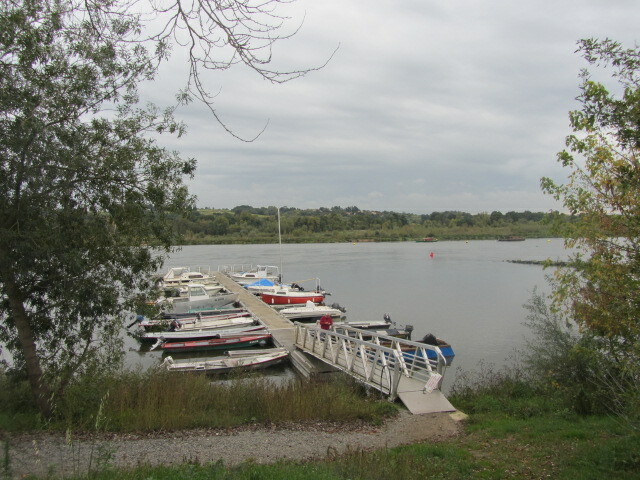 Another good stop to remember for future reference, as it also had direct access to the river for swimming and fishing. 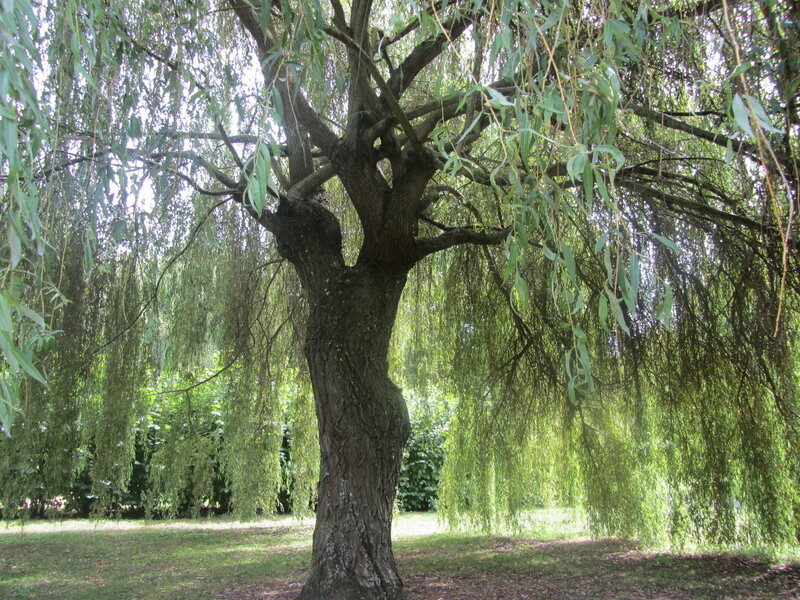 ‘Inside’ the tree. 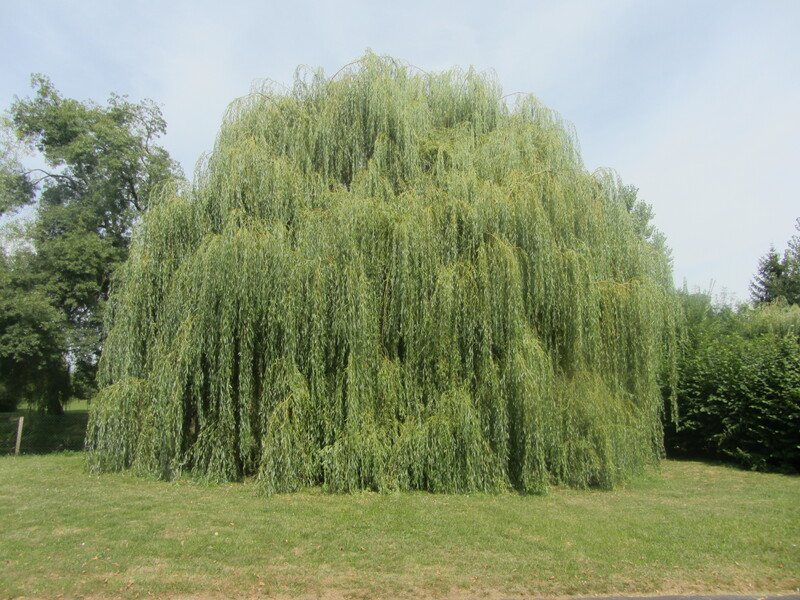 Well, under the branches. I really can’t believe we are now into our 8th week and we only have 5 days to go! 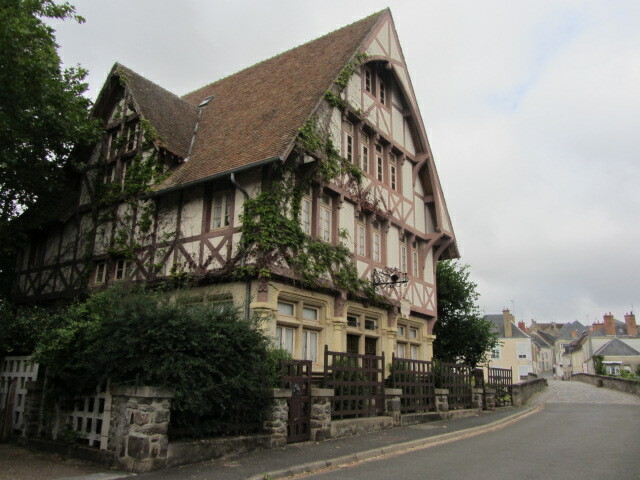 This charming little village is part of the Association des Petites Cités de Caractère de la Sarthe and we’ve been meaning to stop here ever since we’ve been driving up and down this road from Alanҫon to Le Mans. We are glad we’ve finally made time for it on this long journey, which is slowly coming to an end, as we haven’t been disappointed. 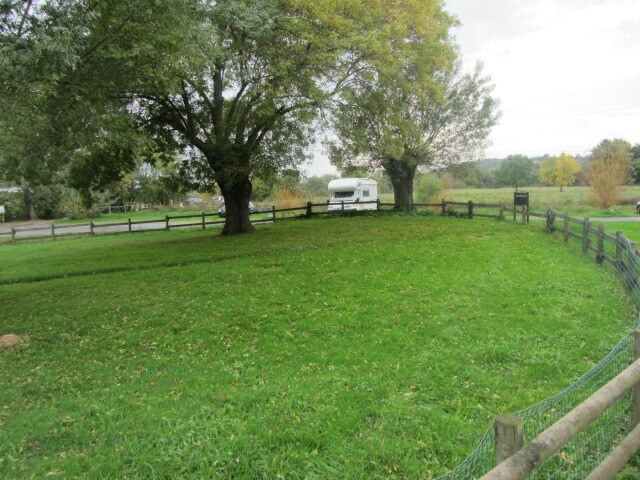 The campsite is immaculately kept, with generous size pitches, access for disabled people to the washing facilities and shower block. 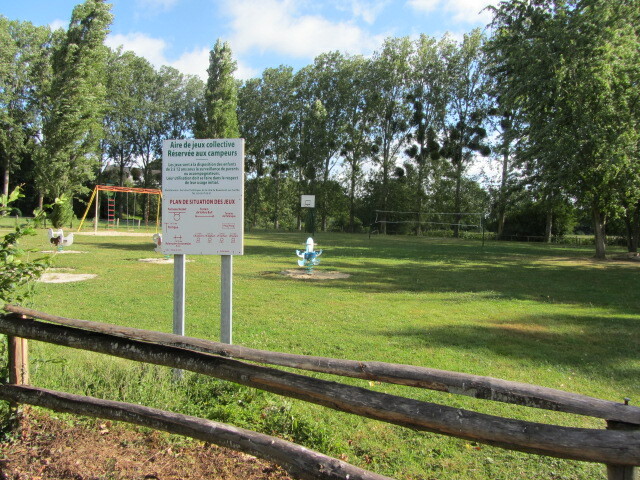 It’s very quiet and peaceful, even though it has plenty of space and a large playground area for children. 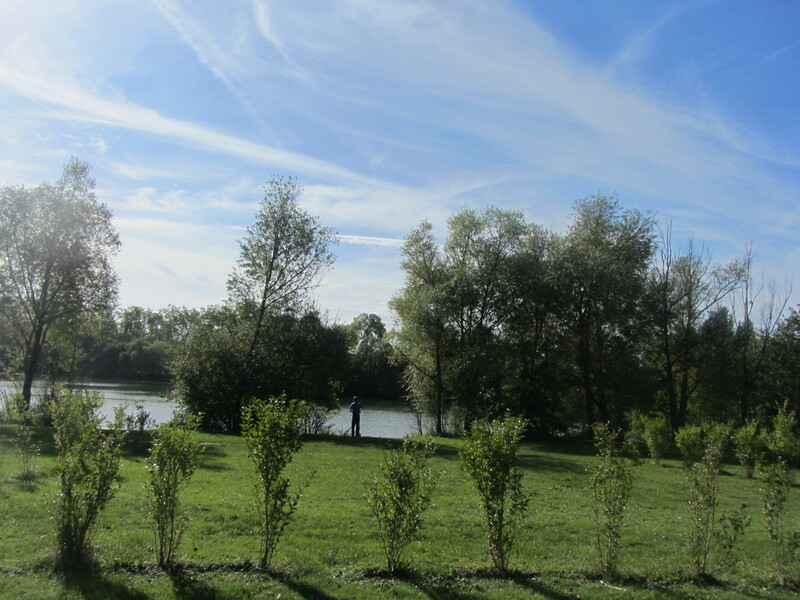 The site is right on the river Sarthe, with easy access for fishing and just a few minutes’ walk from the shops and town centre. The receptionist, Maria Dolores, is very friendly and chatty and speaks several languages, including Spanish, Italian and English, so we had a nice chat in Spanish for a change. I later discovered she’s half Spanish, from Jaén, and half Italian, so I really enjoyed meeting someone from my own country and having a laugh together. 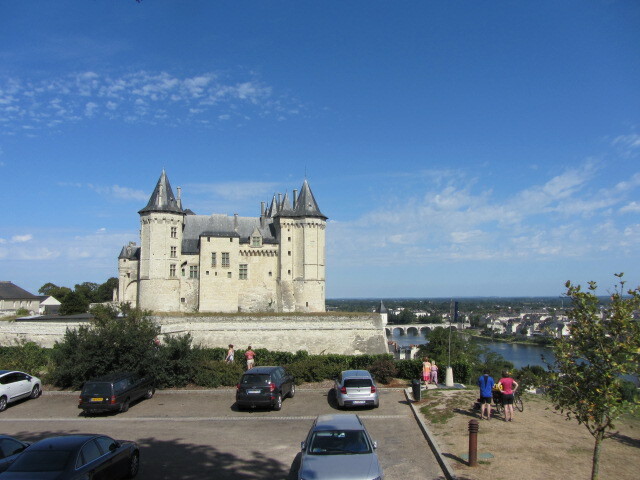 We arrived yesterday morning after a short drive on the A11 from La Suze-sur-Sarthe at junction 9 to J.7, which continued north on the A28, so we avoided the congested ring-road at Le Mans and came off at J.21 for Beaumont-sur-Sarthe. 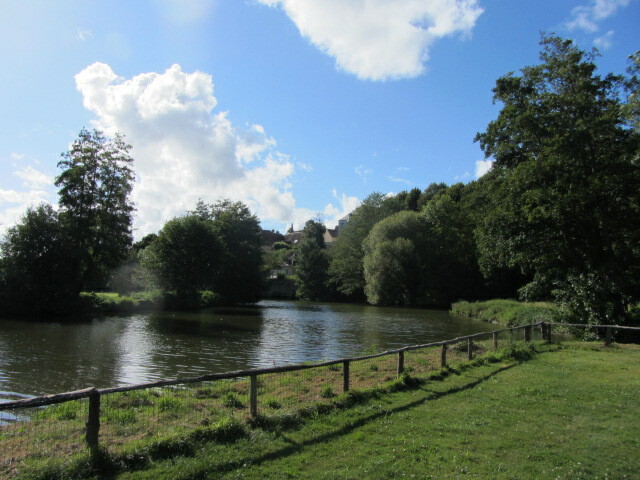 We didn’t do much yesterday apart from walking around this lovely campsite and a gentle stroll into town to buy bread and cakes. 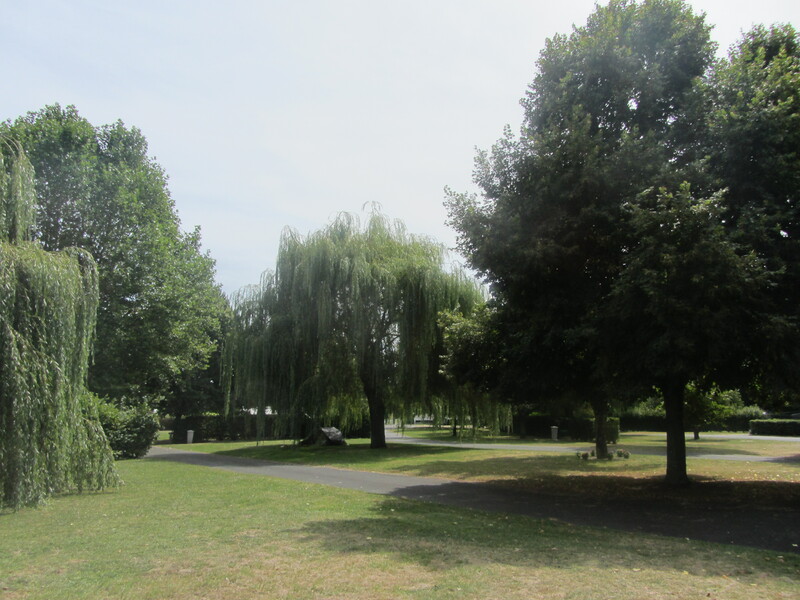 I think the thought of going back to work is weighing on us now and we’re trying to make the most of the good weather and tranquillity of this area. This morning, while Adonis was fishing, I went on a tour of the village and followed the guide given to me by Maria Dolores. 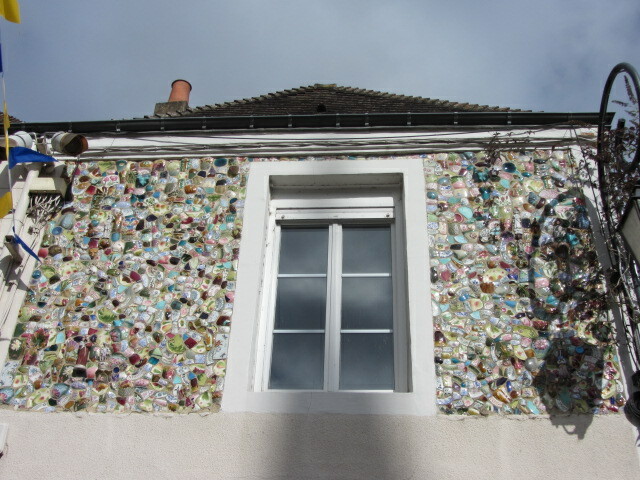 I slowly made my way around La Motte and Rue des Promenades to La Place de la Liberation in order to complete the recommended route and not miss anything of importance. 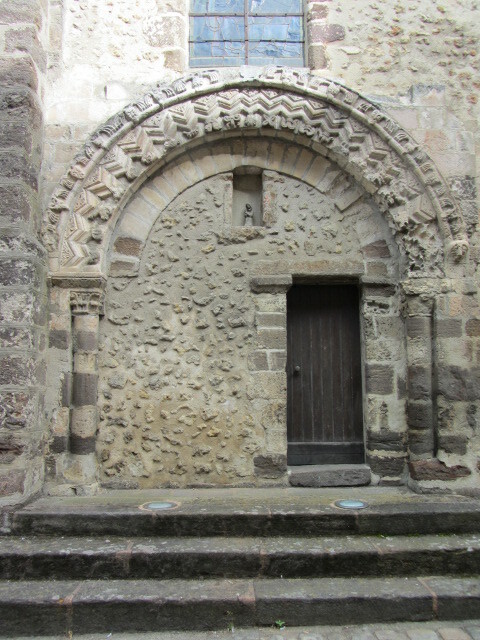 I enjoyed La Porte Romane of L’Eglise Notre-Dame as well as the Pont Roman, of which I took photos. 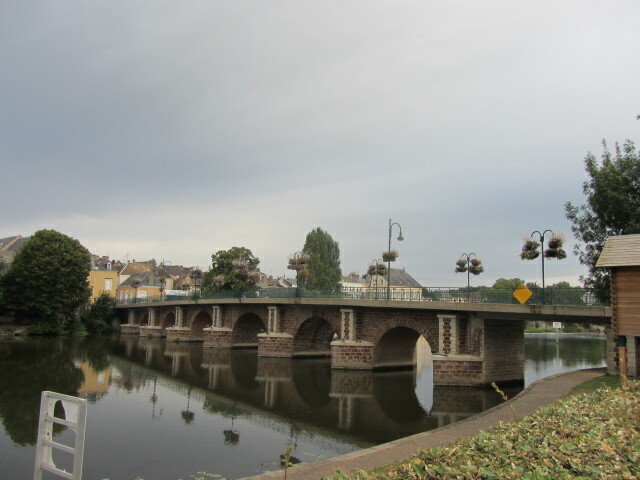 The views from the Romanic Bridge are very pretty and I spent some time admiring them. 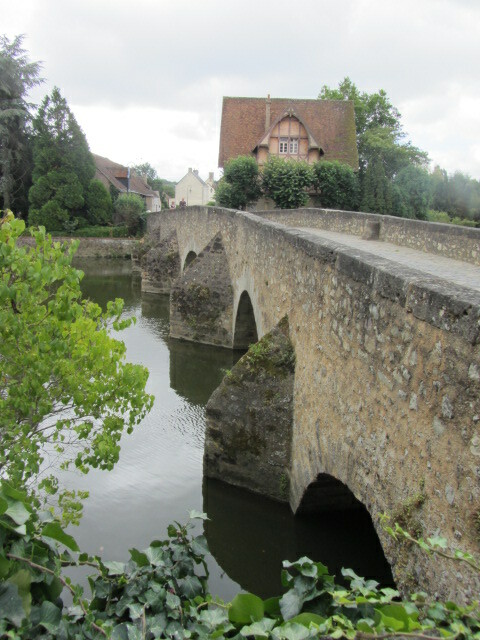 The town itself dates back to the 10th century and it was built within a vast elliptical wall, with some openings being made during the course of history. 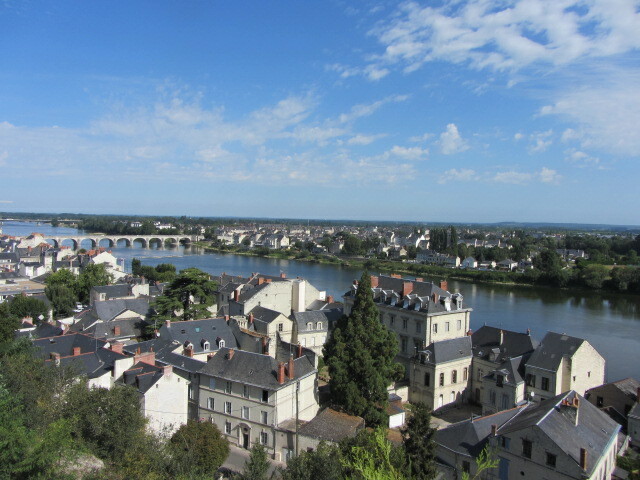 This is certainly a quaint little town to stop in your travels and it’s well worth a visit, just for its simplicity and tranquillity. Tomorrow we’ll carry on north towards Alanҫon, where we are planning to do our big shop before we return home and thus stock up on beer, wine, cheeses, salamis and any other local speciality that takes our fancy. It’s Bank Holiday weekend in England and several British cars and caravans left the site today, but I’m glad we still have a few days left and don’t have to rush for the crossing. The weather has mercifully cooled down and we’ve only reached 28°C, which is easier to sleep in. This is just the ideal temperature for me: very pleasant on the skin without making me feel so lethargic. I shall miss this in the dark and cold winter months. 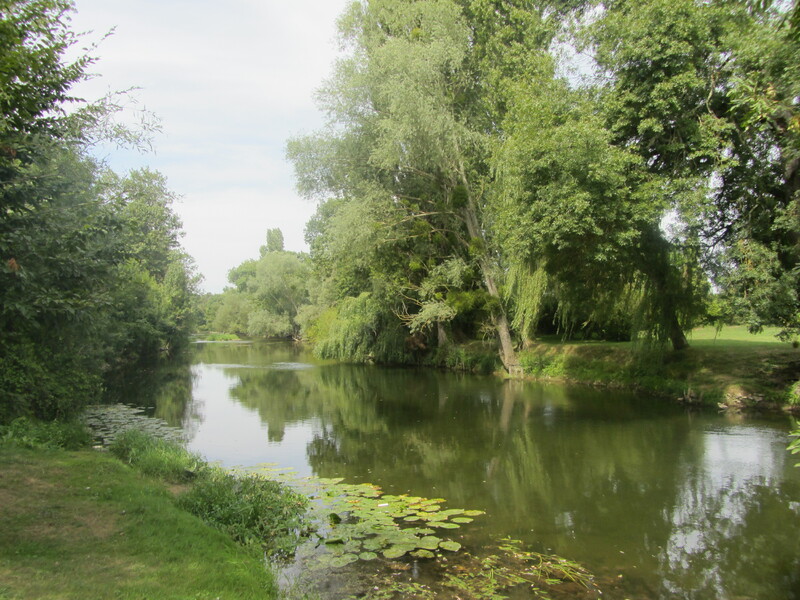 We were here at the end of December last year and we’re glad to be back at this charming aire by the river Sarthe in the summer. 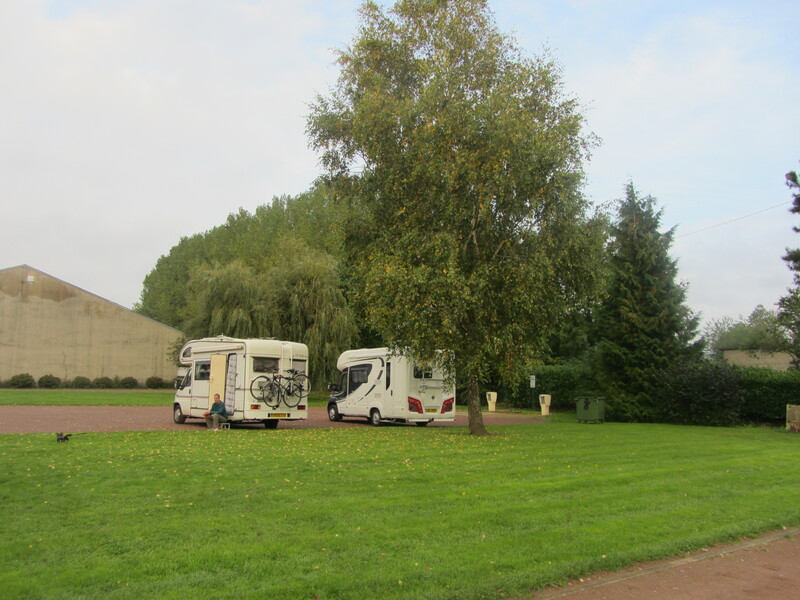 It was quite full when we arrived last night at around 5 pm, but many of the motorhomes left by 10 am this morning. 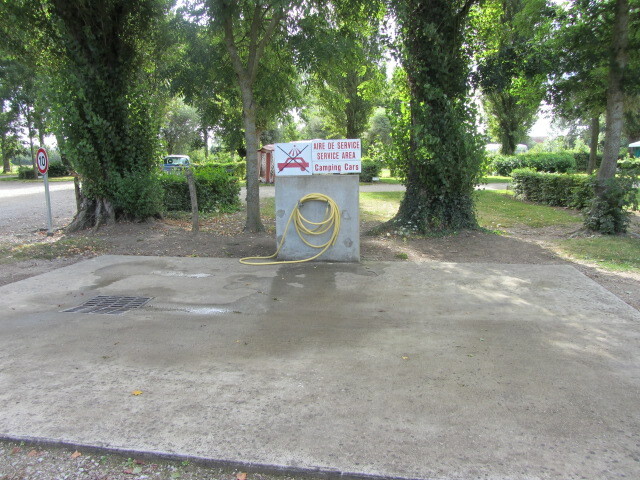 It’s still only €3 a day with electric hook-up, but we’re a bit too far from the electricity supply stand, so we’re running on gas. 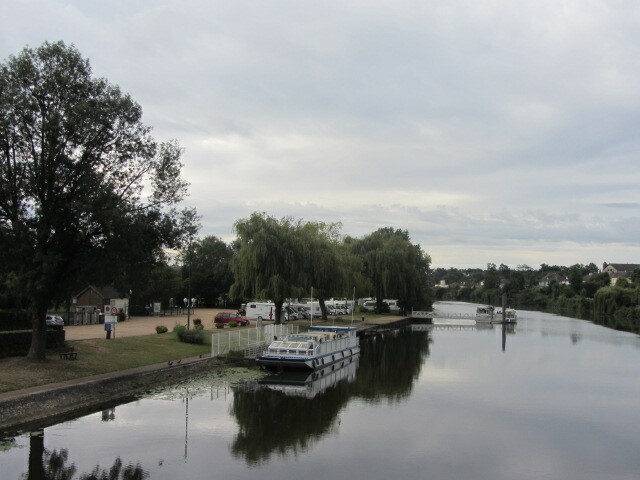 It’s also very pleasant to see the pleasure boats moored at the landing stage, especially the ones decorated with hanging baskets and flower pots: I wonder if the owners live in them permanently or just for the summer holidays. Either way, it looks like a beautiful way to travel too and I wouldn’t mind having a go in one travelling along the canals and rivers. 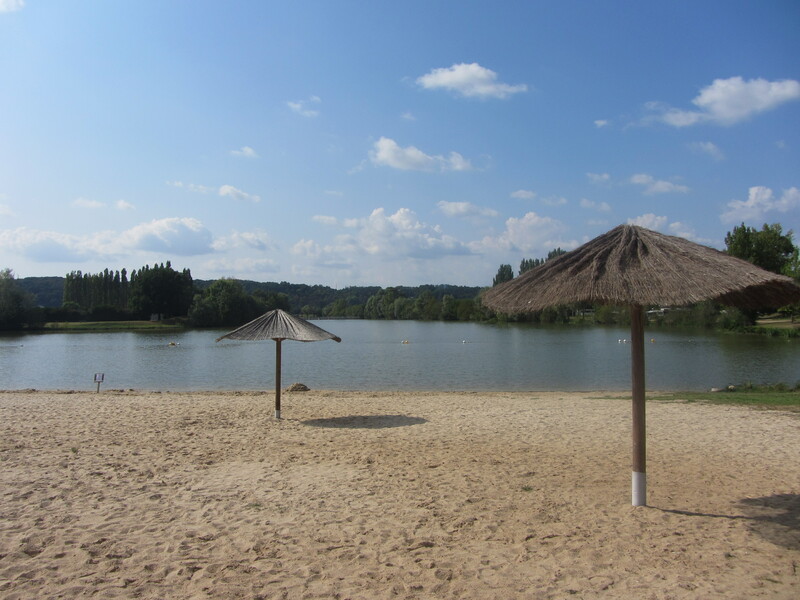 We finally stayed at the tranquil Bords de Vienne campsite at L’Île Bouchard for 3 days as it’s just perfect for us, with lots of shade, a handy supervised beach on the river, clean facilities, free wifi and a Super U supermarket and other handy shops just outside the camping. 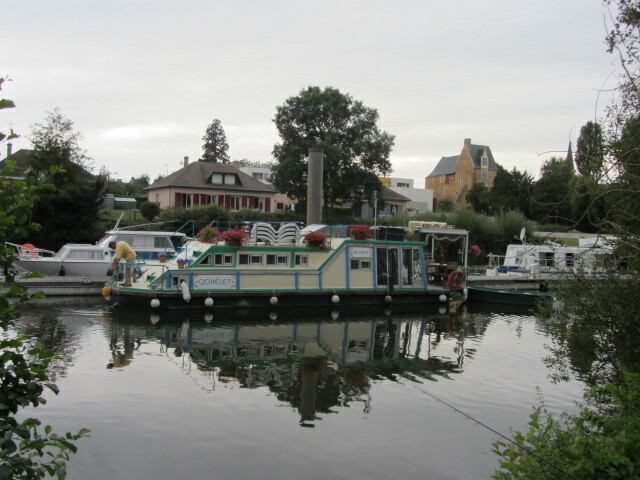 It only cost €21 a day including the electricity hook-up, so all in all, it’s very good value for money. 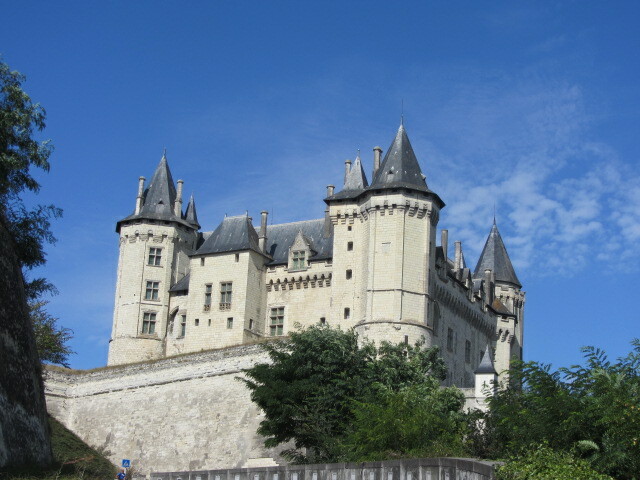 We left the campsite yesterday morning to visit Château Saumur, just under 40 kms northwest of L’Île Bouchard. 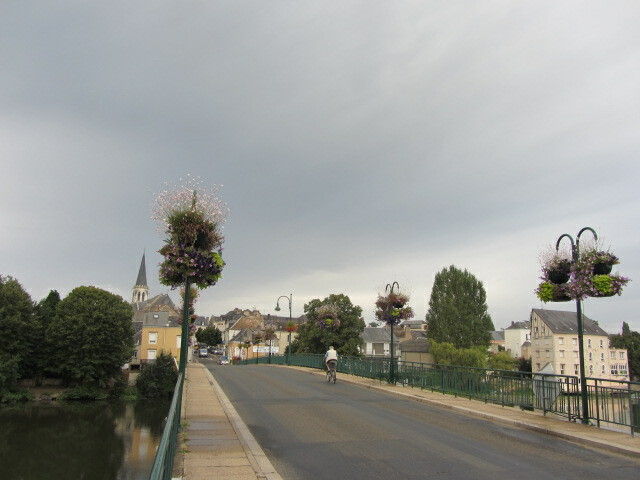 As usual, the main road D760 between L’Île Bouchard and Chinon was closed and we had to follow the diversion signs south toward Richelieu on the D757 and cut across country back onto the D749 main road and D751 to Saumur. 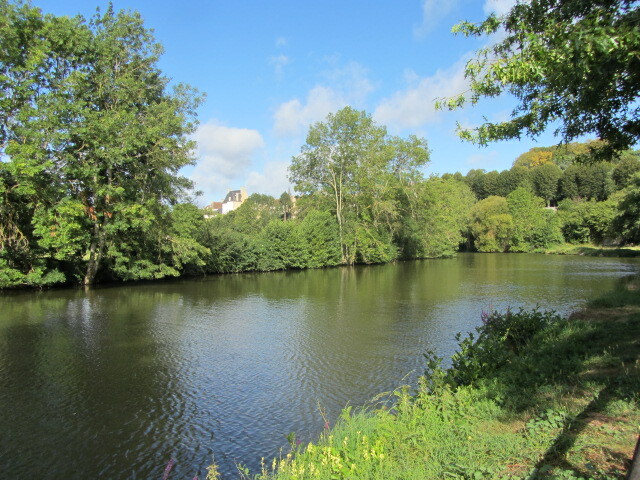 We found a nice shady car park by the river Loire, just 10 minutes’ walk form the Château and strolled there for our visit. 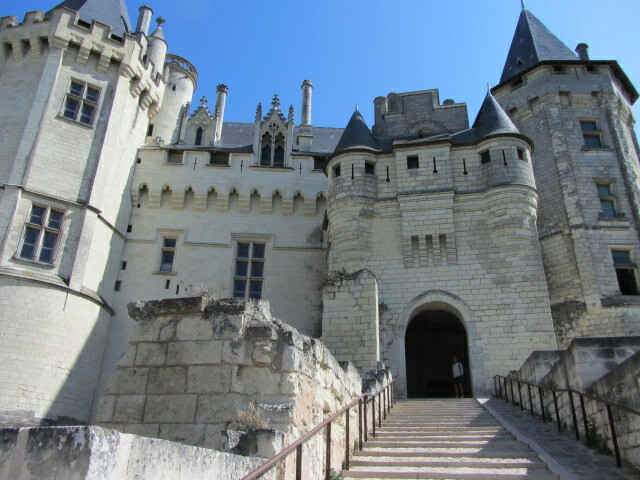 The château is a very impressive fairy-tale-like building on the outside and it’s now a museum for beautiful sets of fine china of various designs and origins, medieval wood-carvings, tapestries and even a collection of taxidermy rare animals, including a huge sturgeon caught in the river Loire. 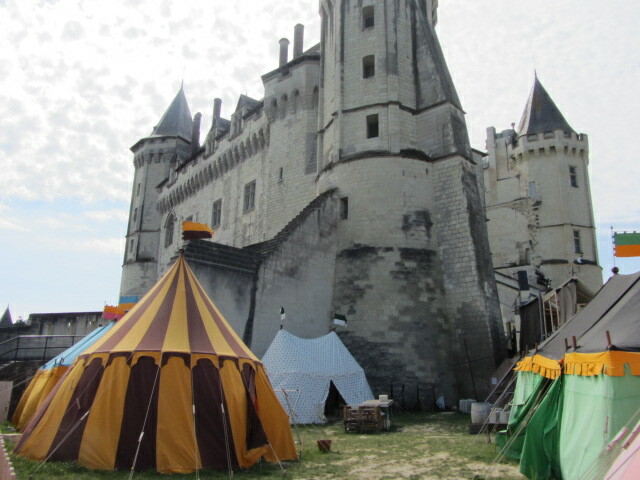 There was a show going on in the château grounds which ran 3 times a day at 11 am, 3 pm and 5 pm, but we made the most of the peace and quiet inside the building before the crowds arrived after the show. 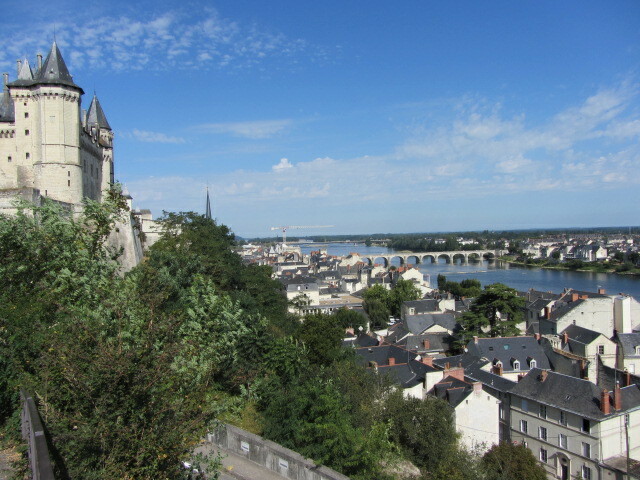 The views of the town and the river are impressive and we took lots of photos of these stunning views. Something else that was very curious as we were driving along the Loire were the Troglodyte caves hollowed out in the chalky cliffs where wine is stored these days. 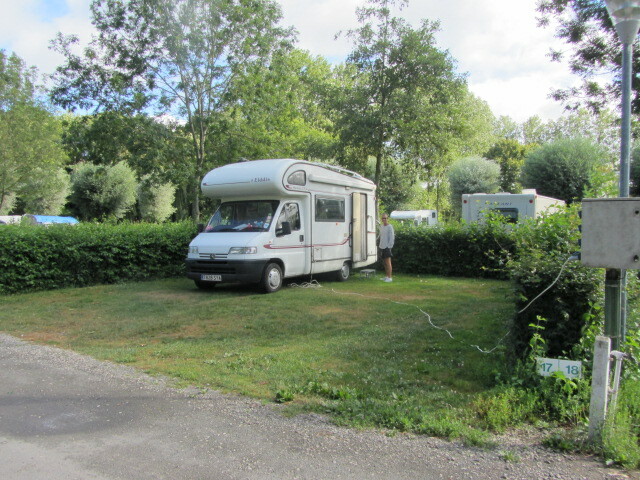 After our visit we intended to stop for the night at the Base de Loisirs of the Retenue de Pincemaille in Rillé, like we did at Easter in 2011, but there was a height barrier at the entrance of the fishing area and we had to park a few metres down the road, which wasn’t very handy for fishing purposes, but pleasant enough for lunch. 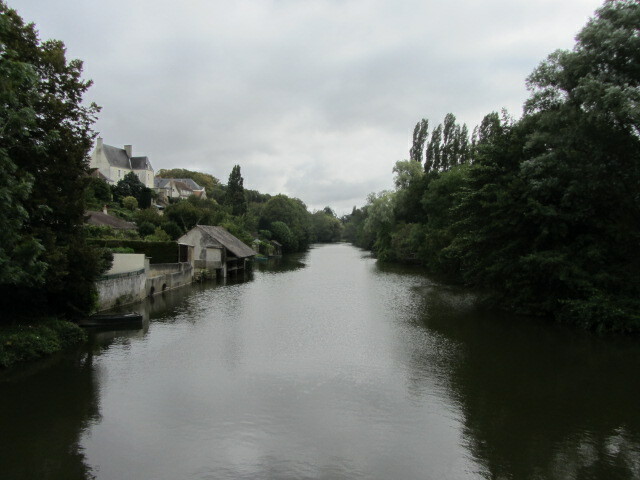 So, yet again, we had to swallow our disappointment and choose a different place to stop for the rest of the day and after lunch we decided to drive up north to La Suthe-sur-Sarthe, which wasn’t very straight forward from Rillé, following various national, regional and country roads. 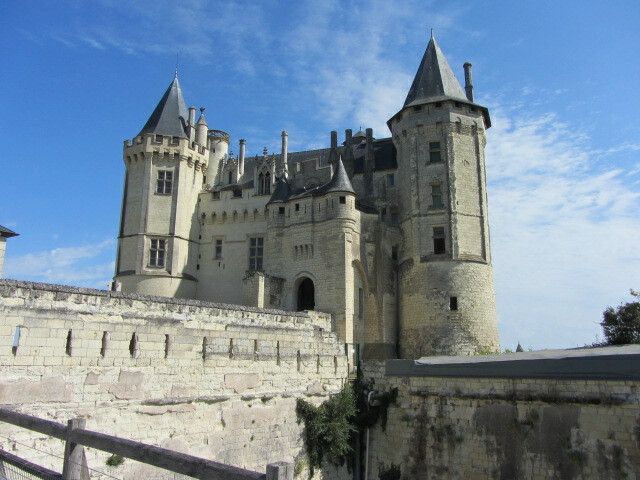 Still, I was very pleased with my navigating skills and got us here without any wrong turns or getting lost in any way. 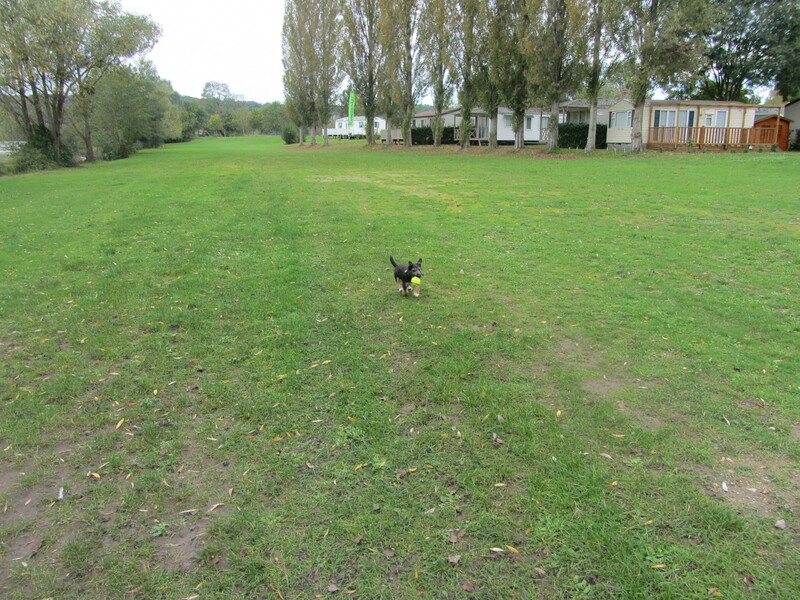 Who needs SatNav when I am on the map? 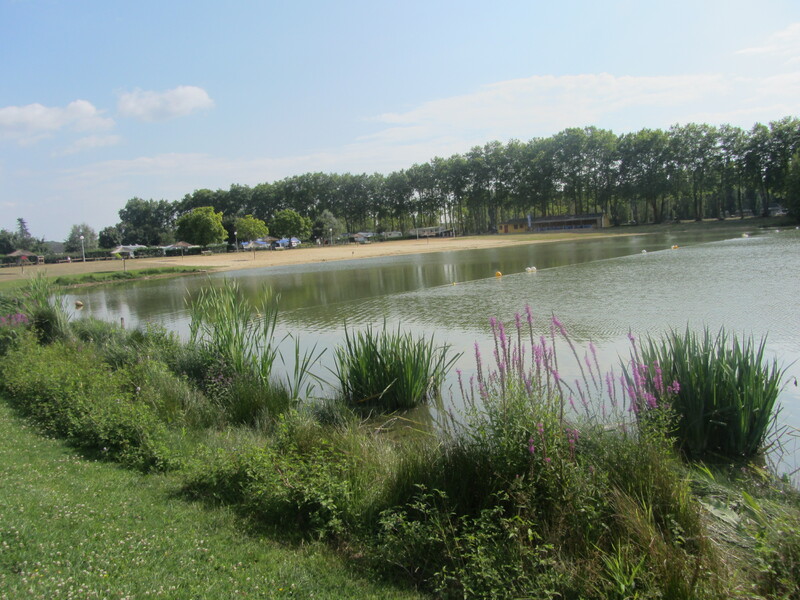 We’re going to stay here tonight as well for Adonis to enjoy a spot of fishing again and tomorrow we’ll be heading for Beaumont-sur-Sarthe, where there is a municipal campsite, between Le Mans and Alenҫon on the D338, so it shouldn’t take too long to get there.